30 men entered the squared circle in 2 minute intervals, and only one man came out on top. 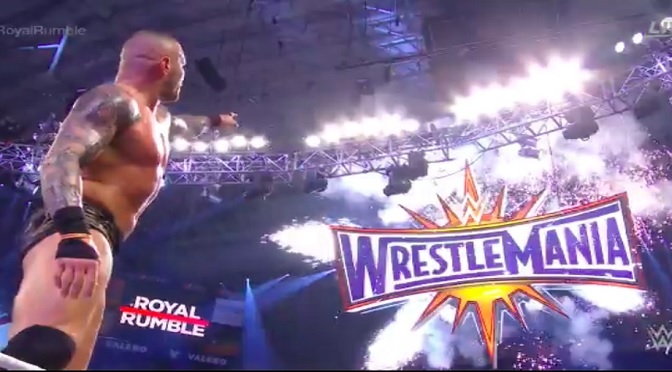 Randy Orton won his 2nd Royal Rumble and I couldn’t be any happier! The Royal Rumble this year was filled with a lot of speculation on the net, from rumors of Finn Balor showing up to Samoa Joe making an appearance. The rumors I’ve heard seemed to be on the up and up when you consider what has been going on in the world of NXT lately. Samoa Joe hasn’t been on televised NXT shows but has been doing a lot of live shows as of late. Finn, however, made it clear he wasn’t going to enter the Rumble due to his shoulder recovery. Other speculated surprise entrants included the likes of Shinsuke Nakamura and Kenny Omega; both didn’t enter but the teasing and trolling was very strong from Kenny. Nakamura wasn’t teased as an entrant, but fans assumed because he lost his NXT Championship to Bobby Roode on Saturday at NXT TakeOver: San Antonio. My favorite entrant was definitely Tye Dillinger. He entered the Rumble at number 10, which is WAY too perfect considering his gimmick and catchphrase. He was eliminated by Brock Lesnar, but I’m still glad he was in the Rumble. Entering at number 23, Randy Orton came in like a bat out of hell delivering RKOs to anyone who came his way. He even faced off against his brother/former brother Luke Harper, who almost delivered the Sister Abigail to Bray Wyatt. It was so close, I needed for it to happen, but Orton intercepted. The end of the Rumble was a face-off between Bray, Orton, and Roman Reigns, who was the 30th entrant. I honestly thought Reigns was going to win. It would’ve been interesting to see John Cena versus John Cena 2.0, but that was not in the stars as Orton tossed Reigns over the top rope to claim his victory. Onward to Wrestlemania Randy Orton!